In early 2004, the curtain rose again at the legendary Hippodrome Theatre. Reborn as the France-Merrick Performing Arts Center, it is the centerpiece not only of world-class stage performances, but of a totally revitalized Bromo Tower Arts & Entertainment District. We are helping to build the future. That isn’t one building or one street or one show on stage. It means an on-going dedication to creating an environment that belongs to all of the people of Baltimore, to revitalize the city, in action and in spirit. The District unites the city’s community and underscores its potential as a thriving arts neighborhood in downtown Baltimore. For more information, visit www.bromodistrict.org. Achieving what one imagines requires creativity, determination, and truly new thinking. The non-profit Hippodrome Foundation was established to reach for and attain that vision. The Foundation, in turn, sought out public and private entities with the foresight to see "what might be." Of course, our most important partners are the private citizens who gave their unwavering support and contributions. Together, we have transformed a venerable structure into an unparalleled, state of the art, showplace designed to fulfill the cultural, educational, and entertainment needs of our city and our entire region. Ample parking within a short walk to the Hippodrome Theatre. Season Subscribers may purchase advance parking passes to area parking facilities and Inner Circle Subscribers receive guaranteed show parking as an added benefit. The Hipp Café located within The France-Merrick Performing Arts Center. For more information visit, www.thehippcafe.com. Abundant restrooms and concession areas and expanded lobby spaces. Repaved streets and sidewalks, improved outdoor lighting, and security provided by the associations and organizations in Downtown as well as on-site security. 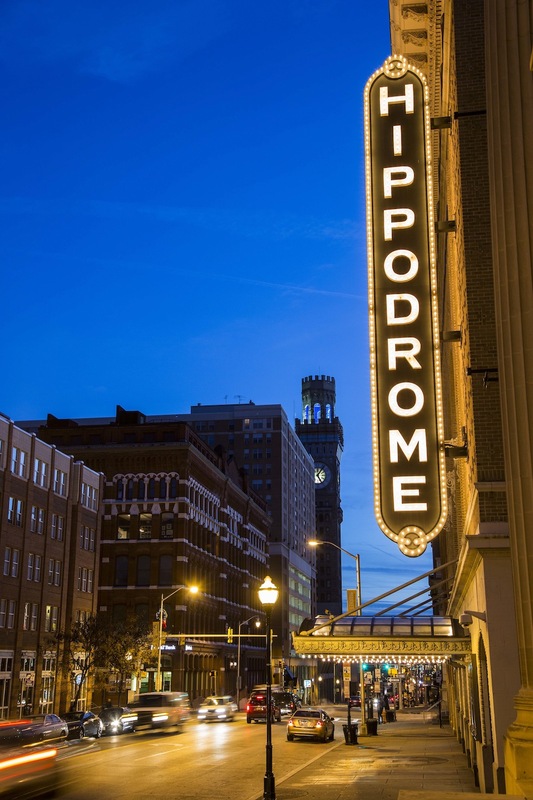 The Hippodrome Box Office is located on the corner of Eutaw Street and Baltimore Street. Hours are Monday- Friday, 11 am-3pm or through intermission on performance days.